Hooray! March has finally arrived. March brings hope that Spring is upon us, especially here in Minnesota. March means basketball tournaments, shamrock shakes, and St. Patrick’s Day. 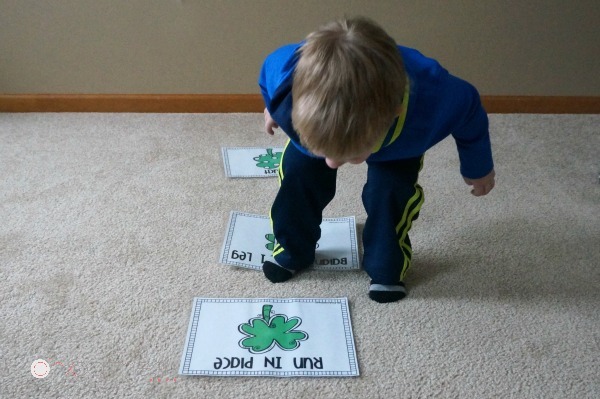 March also means that we are playing fun gross motor games with a St. Patrick’s Day theme. 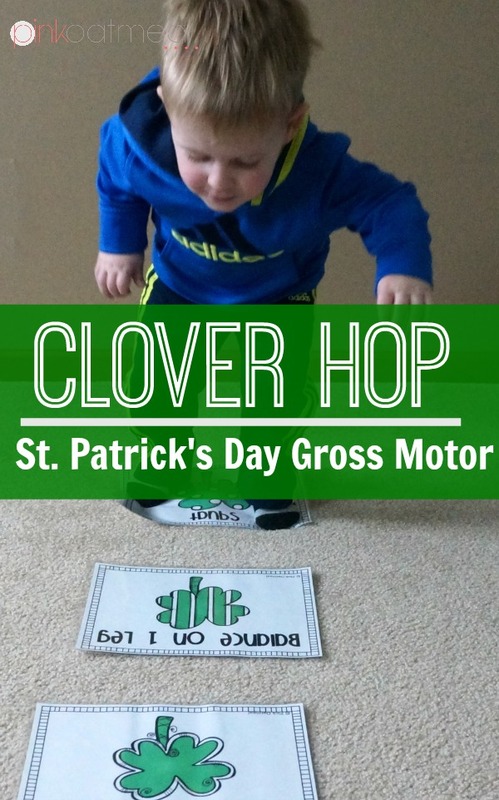 The clover hop is a great way to get kids up and moving. It can be used for therapy, in the classroom, and at home. I love the fact this game works with a single child all the way up to a class full of students. 1. Lay clovers out on the floor with movement words written on the clovers. Have the same amount of clovers as you do kids on the floor. Save yourself time and buy the clovers now in the St. Patrick’s Day Brain Breaks, Yoga, and Games. Laminating clovers is a good idea, that way you can use them again and again. 3. Turn on the music and let the kids hop or walk between clovers- what ever works better in your setting. 4. When the music stops have the kids perform the action written on their clover. Be sure to check out fast, fun, and effective St. Patrick’s Day brain breaks and gross motor ideas. 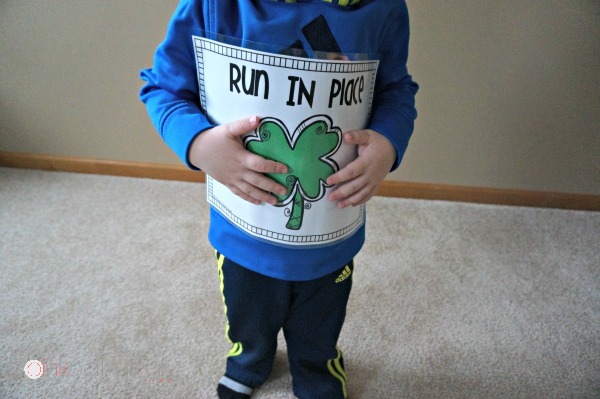 The Rainbow Relay is sure to be a hit with the kids this St. Patrick’s day! Try yoga St. Patrick’s Day style! 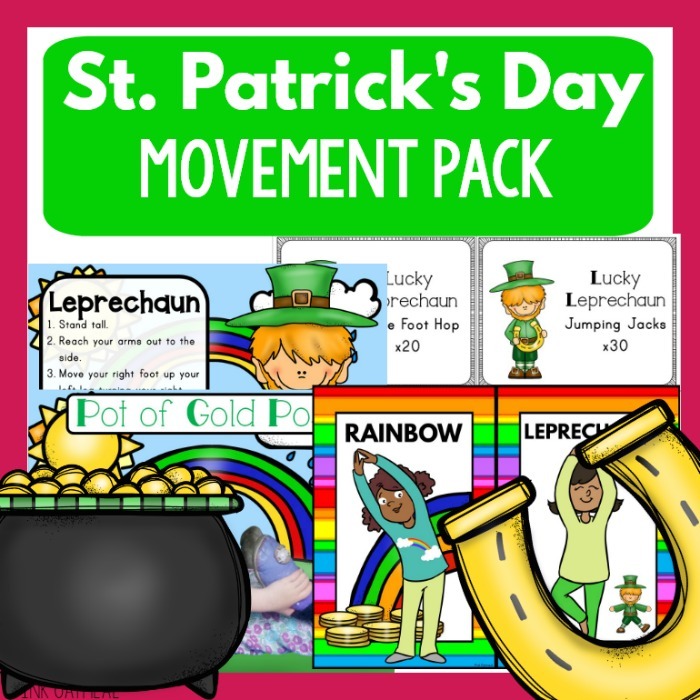 Imagine how great it would feel to have all of your St. Patrick’s Day movement activities (including the clover hop) created and ready to use! Not only would you have it all, but you could feel confident knowing that your kids (and you!) are having fun with physical activity and movement! You will have activities for St. Patrick’s Day that your kids love. You will have screen free activities to promote movement. You will have fun activities for your brain breaks, morning meetings, home or therapy sessions. You won’t have to be spending time searching and creating your own resources, it’s all done for you! Check out the options below! 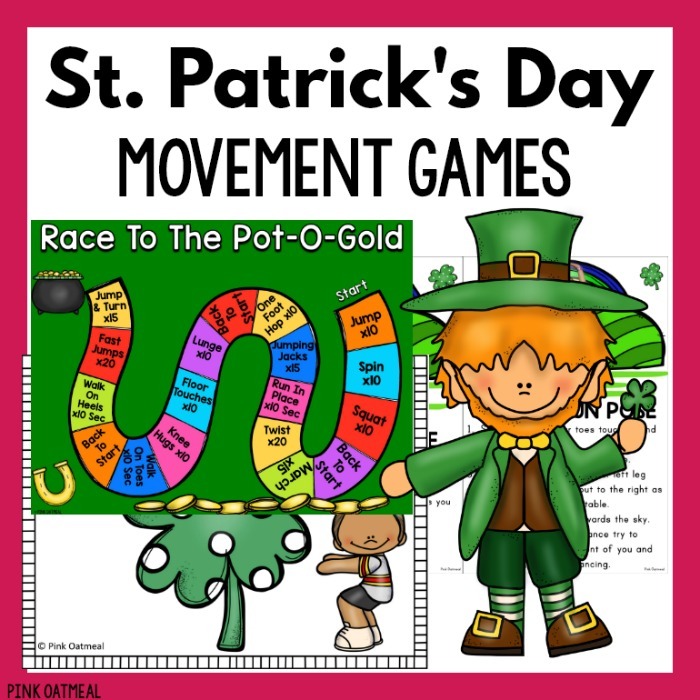 I have several gross motor games included in my St. Patrick’s Day Brain Breaks, Yoga, and Games. Some favorites include the Rainbow Relay and Clover Hop. Get this now in the shop . How about saving a lot of money and getting everything you need for St. Patrick’s Day gross motor and physical activity? Pink Oatmeal has taken care of all the work and hassle for you! Get EVERYTHING in the St. Patrick’s Day Movement Pack. This is available for you at a major discount in the shop.